TOKYO (Kyodo) -- Sports events that were scheduled for Saturday in southwestern Japan and elsewhere have been called off due to a series of massive earthquakes that first shook the island of Kyushu Thursday evening. Soccer, baseball and basketball games that were to be played in or near the quake-hit area were canceled for safety reasons as aftershocks continue and a biggest-yet magnitude-7.3 temblor struck early Saturday morning. In the J-League first division, two matches were canceled. The match between Avispa Fukuoka and Nagoya Grampus at Level-5 Stadium in Fukuoka and the Sagan Tosu-Vissel Kobe match in Best Amenity Stadium in Tosu, Saga Prefecture, will not be played. The cancellation of two second-division and two third-division matches were also announced. In JPB, the SoftBank Hawks-Rakuten Eagles game that was scheduled to take place at Yafuoku Dome in Fukuoka was called off. The Yomiuri Giants-Chunichi Dragons game that was to be played at Fujisakidai Stadium in Kumamoto Tuesday has also been canceled. The Hawks have yet to announce whether Sunday's game -- the final game of a three-game series against Rakuten at home -- will go ahead. 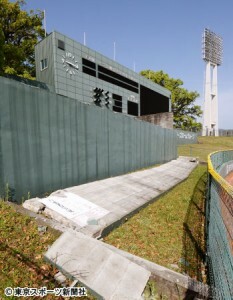 It is the first time that a baseball game has been canceled because of an earthquake since the Rakuten-Yomiuri game at Kobo Stadium Miyagi (then Kleenex Stadium Miyagi) in June 2008. In basketball, the NBL game between the Toshiba Brave Thunders Kanagawa and the Kumamoto Volters at Todoroki Arena in Kawasaki has been canceled.